By now, the world is paying attention (or might be tuning out) to the catastrophic events that have taken place in the wake of Hurricane Harvey. The flooding, the crisis and overall panic of the cities of Houston (appr. 2.4 million), Corpus Christi (appr. 326K), as well as surrounding areas has left many people displaced, discouraged and disconnected from their health resources that help keep them alive. Before I address the amazing health advocates on the ground in and outside of Texas mobilizing to provide emergency resources and extended rebuilding supplies, I want discuss something that people seem to be griping about on social media. As a native Floridian, I've lived through sev-er-al hurricanes, freakish lightening storms and tornadoes, so this is coming from that perspective. Why didn't the mayors of those towns evacuate those poor people? Ma'am/Sir...have you been stuck in traffic on any interstate before on a regular day? All appr. 2.4 million residents aren't ever on the highway at the same time and traffic is still hectic, first of all. Now, imagine ALL the residents trying to leave...but add in rising waters on the interstate (where fatalities would have been higher), subtract those that don't have their own transportation and are in their homes as the water rises, and if you DO happen to evacuate but have pets, I hope you're staying in a hotel (which requires some sort of funds because not all hotels were shelters). Most emergency shelters don't allow pets because of allergies and capacity, so where are you going to put your dog and cat? In weather like this, you cannot predict what will happen, what will go wrong or how long it will last - even in well, prepared states like Florida, there is always something unforseen that happens. And eventhough the actual hurricane is over, the rain hasn't stopped in all areas. The water may have receded in some places, but there are many neighborhoods and communities that are never going to be the same because of water damage. The other concern has been where to send money, resources and/or how to get items directly to people that need help. Well, I have great news! There are several health advocates that have orcehstrated health supply drives and created a Facebook group tp house all the information that will help. This group, named "Hurricane Harvey 2017 - People Who Need Medical Supplies/Devices serves as a non-emergency service that is taking donations & mobilizing volunteers to fill untapped needs for patients with chronic conditions who may need things like ostomy supplies, salt packets, Sharp's biohazard boxes, ziplock for meds, benadryl, etc. etc. etc. This is not an emergency service. They will be collecting items for a while as people continue to battle through the process of rebuilding their homes, pharmacies and schools. There is an Amazon List set up that will be constantly changing. Volunteers are ready to receive packaged items as well and there are other groups for rescue and recovery linked within the posts on the Facebook page. If you need emergency medical assistance please reach out to those groups who have a direct line to emergency services. I find this method to be a perfect solution to those that are uncomfortable with texting to non-profits, but I also challenge you to look into your communities civic groups. Most long-established groups have international or national boards that are charged to respond to natural disasters like this. For example, Kiwanis have several of their clubs gathering supplies and responding. Most states have local affiliated clubs that you can contribute to. Rotary clubs around the nation are partnering with ShelterBox to provide hundreds of light privacy tents to families that are displaced temporarily. Lastly, one of my favorite organizations, Habitat for Humanity is mobilizing in many other states to provide resources and assistance in the rebuilding of communities throughout the impacted areas of Texas. As things slow down work-wise for me around the holidays, I plan to reach out to one of these organizations or partners and find something I can do that's hands on to help elevate the spirits of those that need it. I know from my experience in 2004 with Hurricane Charley, plus the three others that hit my community in one summer, back-to-back. We lost power for a week. My daughter was one, I lived with my elderly grandmother and disabled veteran mom. It was hot, scary and frustrating but we were blessed. We lived on high land and didn't experience much flooding but with gas stations running out of fuel, people couldn't run back-up generators, food spoiled and the list of difficulties went on and on. It's not something I ever want to go through again and don't want anyone to experience either. 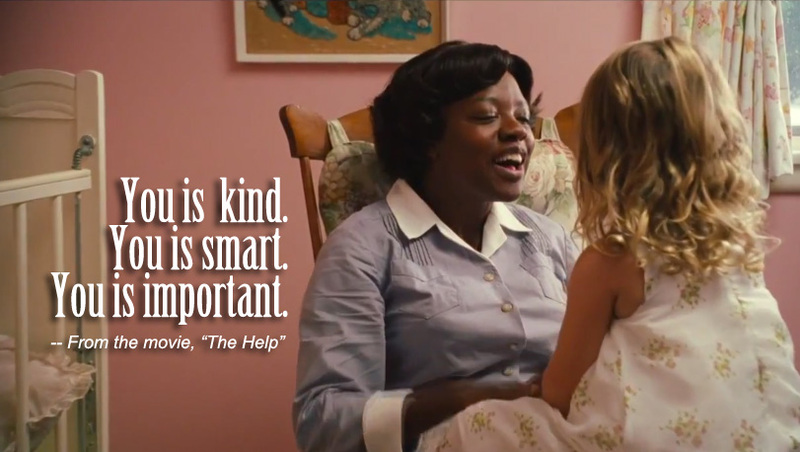 I believe we live through things to be the help others are looking for. I'm ready to roll up my sleeves. Are you? So, I'm finally back from #HealtheVoices17 and after a full day of rest, I am still at a lost for words on how to summarize or describe my experience there. There were tears, inside jokes, tons of laughs, and a lot that I learned that will enhance the impact I have in my social media advocacy. One thing is for certain in the goal I set for my attendance at HealtheVoices this year. I did not want to be the same person leaving that I was coming in. Coming in, I was stressed from family issues, burned out from advocacy/policy work, and feeling overall depleted so I was running on autopilot. The first day activities with the #PurposefulConnections HIV Summit knocked all of that out the gate as soon as Rhonda Waters of Johnson & Johnson's HPI (Human Performance Institute) had us re-evaluate our values and get to the core of why we do advocacy in the first place. So, walking out of the conference on our last day Sunday, I was definitely felt back to a empowered place of authenticity. I felt more rooted in my passion. I just want to share with you five things I have immediately implemented or an in the process of adding to my advocacy toolkit. 1. Add a medical disclaimer to your posts or website. I spoke with Benjamin Di'Costa, a fellow HIV advocate and among many other wise social media tips he gave, I realized this one was such a simple one and I had overlooked it. It protects advocates, while we are patient experts, we are not always medical professionals and are only speaking from our lived and learned experiences. There are a lot of examples throughout the internet that can be tailored to fit the needs of any advocate. I have now placed this disclaimer throughout my website because what I may advise may not always be what I know for each individual person that reads my content. I want us both to benefit from this relationship and for no harm to come to either of us. 2. Making videos is easier than one thinks. When I attended a session on creating impactful video for advocacy last year, Josh Robbins had amazing tips on scripting, lighting, audio and apps to use that were super inexpensive. Cameras intimidate me eventhough I know that using video is effective, so I didn't fully implement his tips or take them seriously for my work at the time. This year, he gave great tips on the same issues, but hearing it again as well as other attendees experience using what works for them, I have now found that I can afford and accomplish bite size videos that will help me in HIV advocacy. Lilly Stairs even posted in our HealtheVoices Facebook page, this great app in iOS called Clips that does closed captioning so followers that are hearing impaired can access content. It's FREE! It's EASY! It's FUN! I'm starting out with that one and hope it takes me to another level. 3. Legislative advocacy is critical. In a session by Type 1 diabetes health advocate Christel Aprigliano and Public Affairs Council expert member Nick DeSarno, a wealth of information was shared on how to effectively speak with your congress members, their staff and if they refuse to host public forums, there are effective ways to "out" them that will help bring the importance of your cause to light. One thing I think is effective is to attend their campaign events, town forums or party specific fundraisers and ask for a photo opportunity with them. Be sure to wear a shirt that speaks to your cause in a bold statement, then post said photo to social media with whatever policy oriented hashtags or messaging is best suited for the position you want them to consider for your cause. I'd even go the extra mile and send them a copy of the photo as a thank you card. Being reslilent in policy work is the key. Decisions in legislation are not made overnight, building relationships is key - and never, ever give up. There are many variations of what words can be put in place of "trigger warning" such as specifically what is mentioned, i.e. "may contain an image of blood", "warning: do not read if needles make you uncomfortable", etc. When you place a specific amount of space in a Facebook post, it automatically hides it from the viewer with a "See More" prompt which I used to find annoying, but now see how it's purpose is incredibly beneficial to protecting my audience. 5. Not being a 501c3 does not limit my advocacy work. Thanks to Janssen Pharmaceuticals, Inc., the Community Foundation of New Jersey and online patient advocates everywhere - we can now apply for a charitable grant that engages, informs and empowers patients in our community as well as combatting stigma and isolation. The grant sizes will range from $1,000 - $5,000 and will be held to a project completion in September 2018. This was amazing news as I (like many others) are full of ideas, but don't have access to funding and feel limited in my advocacy reach. There are certain restrictions and qualifications with this grant that you can read about here. I am incredibly grateful to the staff of Janssen and The Community Foundation of New Jersey for providing this opportunity to so many amazing advocates that are truly further empowered to change the world. This is a short list of things I have learned and put into practice in the past two days after HealtheVoices17. With the network of friends I've established, I know that there will be more and so far I feel more deeply rooted in the work around me, thank you just isn't enough. It's that time of year again!! I'm so excited and I honestly only get excited for one event of the year as much as this and that energy is reserved for Thanksgiving. I guess you can equate these as the same since I am TRULY thankful for my attendance, participation, and opportunity to experience this. So, last year I got to have this amazing experience with health bloggers and social media experts from all over the nation. Around 80 of us gathered in downtown Chicago for #HealtheVoices16 and I can tell you it was nothing I expected. You can read about it here. Now, I'm here to write about #HealtheVoices17 and from an even more cool and different perspective. I have had the honor of working as an advisory panelist AND a presenter to help plan the conference and offer input on what will make this year one to remember in providing skills and resources to health bloggers and social media experts again. I mean, it's no coincidence that someone with a grassroots organization called emPOWERed Legacies, works to help empower patients, #amirite? What: HealtheVoices - conference designed and built to meaningfully empower and develop leaders in patient advocacy across the nation and various health conditions. This year's theme "Together We Thrive" stems from last year's theme of "Deeply Rooted" where bonds and connections were formed that stretched across health issues, personal experiences and varied diagnoses to unite the participants in a collective experience of empowerment. This year we will show the various and powerful ways that we thrive through all of our health conditions even more so than last year since a LOT of the sessions were planned by and led by the patient advocates (the experienced experts) themselves! *The official conference begins on the 21st, but the day before, small groups of advocates from specific health conditions will meet for a pre-conference summit to kick off their experience. It's going to be a family reunion for the #HIV tribe! I cannot wait! Why: In case this isn't emphasized enough, this conference is a gathering of health patients that are experts and advocates in their field of health condition. These conditions range from Inflammatory Bowel Disease, Psoriasis, HIV, Mental Health, Type 1 & 2 Diabetes, to Breast Cancer, Alzheimer's Disease, Rheumatoid Arthritis, Heart Disease, and Multiple Sclerosis (and more). This is an opportunity for the patients of these conditions to gather with other patients that utilize social media to advocate for their community and be a "healthy voice" to inform, motivate, and connect about the ins and outs of their health. Don't be misled, these advocates aren't just posting and sharing scientific data, which is a strong and useful component to understanding health conditions and how they impact any community, but these are movers and shakers, mothers, daughters, husbands, fathers, athletes, teachers, wonder women and supermen all trying to navigate life and live it to the fullest. They give you a glimpse into their life, what wakes them everyday, what lifts them up to speak out, what carries them through their diagnosis and demonstrate what living really looks like. I want to share these individuals with you, but since I don't have permission just yet, follow #HealthEvoices17 and you will meet them through their social media as they post. There will also be moments for fun, connection, networking and relaxation. This year will be the first ever Open Mic night where patient advocates will get to express themselves through their talents as well as group dinners where we will fellowship and break bread and getting to know one another better. It's going to be fun on epic proportions and I cannot wait. You'd think as excited as I am I would have started packing by now, right? Feeling left out? Have symptoms of FOMO? If you couldn't be a part of the in-person experience of HealtheVoices, fret not because participants will be live streaming the sessions and you can definitely follow the hashtag #HealtheVoices17 through all social media platforms as well as directly from @healthevoices accounts. Thank you again to Janssen and supporting sponsors Facebook, healthline, WebMD, WEGOHealth, Wisdo, and YouTube for making this experience such an enriching one for all participants. Thank you for setting the bar for health companies to meaninfully value patients for their experiences and give them a platform to magnify their voices. Now, time to go pack! I'm trying to not be overwhelmed, frustrated or hard on myself for neglecting my blog. I do not own the monopoly on being busy. I think it's a rites of passage for people to be able to have so much on their plate, they can say that they are too busy. It's not healthy though. So with that being said, I'll give a quick run down on why I abandoned another attempt at a series blog, dust my shoulders off and move on to my current life. Last blog post, I was on a roll focusing on using prompts to get my thoughts out and was pretty satisfied with the inspiration it generated in spite of the political cess pool I was surrounded in after our 45th President was elected. 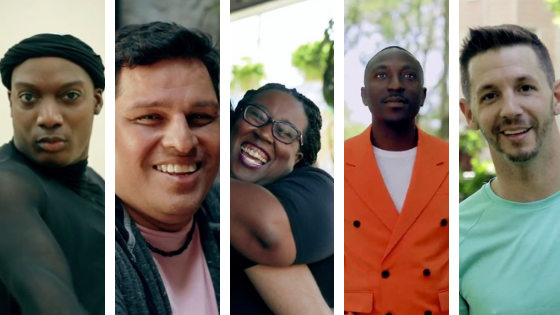 I was also just starting out at the new Florida Community Organizer for The SERO Project to help modernize HIV specific laws that were being misused to prosecute people living with HIV based on their status and not the actual transmission of the virus. That included a lot of traveling, meetings, conferences, webinars and coffee. During this time, my paternal grandmother passed away suddenly. Actually, my last blog post was a week before her 79th birthday and a month before her passing. I flew out to Arizona to be with family that I hadn't seen in over 20 years. It was heartbreaking, healing and horrible. I might blog about that later, since I did make away with my grandmother's favorite coffee mug! So, through the Thanksgiving and Christmas holiday I was an emotional wreck and come New Year's I was using what little energy I had left to not be depressed. 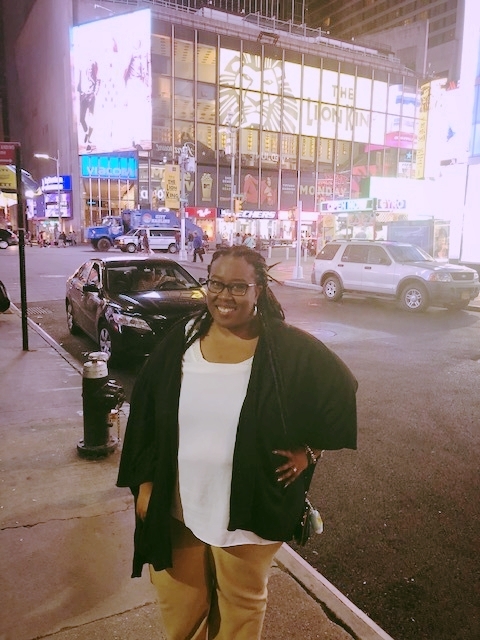 I attended a women's retreat where I was slotted to speak on HIV criminalization; however was the one who walked away feeling that I had embraced and learned new things. I will definitely blog about that soon. My time there is what kept me from going under, pushed me into seeking a professional mental health counselor and brought me to a place of healing and peace. So, I started the year off with a vision board and a word for the year, "SURRENDER". When I tell you about the year I've had so far, you'll get it. It's not about giving up, trust me. So, there you have it. I abandoned the health writer's challenge not because it was a challenge, but life was just loud and in the way. I might revist those prompts just to say I completed it and I might just move on. There is so much in my life that I am learning about what makes me operate. I feel that I have to stop waisting time with looking back and feeling incomplete. I need to look back to know how to move forward. Just small glances to remind me how far I've come and how much closer I am to fufilling what purpose I have on this planet. I wouldn't be me if I didn't post something amazing and random! My amazing is that I am in love with our new family car, Ford Escape. I've always wanted an SUV that wasn't too big and it's changed my life. My random is that I have a new clothing obsession thanks to my twin friend. I've become a LuLaRoe junkie. I only own one piece to date but I have already found my unicorn piece, just can't find it in my size. This has happened in a span on two weeks max. I fought it as long as I could and then I went to an online album party by the amazing Amy Ball and got my first Amelia. OMG! A dress with pockets, I cannot resist. Cannot. Then I'm attending Twin Friend's party at the end of the month as well as hosting my own with my longtime MySpace friend Mahealani Maes out in CA! I'm sure there will be more spiraling from that! Ok, so thanks for those that have stuck around and wandered back to my posts squinting through the dust to see I'm still here. I'll be working on rebranding and making this more interactive instead of like a journal. Which reminds me of another reason I haven't been around...this INFJ thing can be heavy ya'll. I think this accurately expresses the excitement, honor and joy I felt when I received an email from Arneta Rogers, (pronounced ARR-nee-tuh) Positive Women's Network - USA Policy & Advocacy Manager. I distinctly remember I was having a pretty fabulous day as Florida HIV Justice Coalition celebrated their HIV modernization bill SB 625 had just passed the Criminal Justice committee with a unanimous vote. I was back in my hotel room with my daughter who was with me on Spring Break and decided to check my email before the end of the day. Disregard the 3,380 unread emails - a lot of them are list serv chain responses. This cannot be my life. There were 40 amazing, talented and dedicated applicants. Out of them, I was chosen to be among twelve great women that are ready to do the work and take names later. The process to apply really happened for me at the last minute. PWN kept announcing it and then someoine mentioned in an email non-related to this that they hadn't seen an application come in from me yet. I was stunned and kind of laughed it off. I was scared to make the time committment because SERO is my priority and while I knew that these two opportunities would go hand in hand, I didn't want to stretch myself too thin. Then another PWNer mentioned to me in passing that she thought I should apply. She said, "Don't think about it, just do it." So, that's exactly what I did. I told myself, if this is meant for me, then it will be. This year whenever I have been nervous or apprehensive about taking a leap of faith, I look up at my vision board to remind myself how confident and inspired I was when I made it. The entire right side of my vision board has phrases like, "Leading woman", "StrongHer", "She's the Boss", "Build Your Dream", "Nothing For Us Without Us", "I am Enough" and images of Michelle Obama, Janelle Monae and I even put a image of myself standing among them because I stand on the shoulders of greatness. Looking at that board told me that I could accomplish something great with this fellowship. I don't know what that is yet, but I know I will be prepared to try. I hit send on the application and didn't give it another thought. Until I received an email asking me to prepare for a video interview. However, I knew and was comfortable with my interviewers Arneta and Cammie. They asked me questions that made me dig deeper to my WHY I wanted to be a part of the fellowship, what my plans were for my future with the training I'd be given and other questions that helped me own my truth about how little I knew about policy work, but how much I knew this fellowship would not just help me but my community. I plan to bring all the knowledge I gain to others. After the interview, again I put it out of my head beacuse I didn't want to stress too much about it, but inside I really was on pins and needles to know who was selected. And then, that beautiful day came when I got the email and I screamed with joy and felt all warm inside. The next question was...who else is going to be in this inaugural team? I'm looking forward to working with the amazing 12, getting to know those that I haven't met before and work with those who's reputation I've admired from afar. I can't believe I'm a PWN Policy Fellow. You can meet the others here. We are also assigned a coach and by coach, I mean Rock Stars of policy and advocacy work. Suraj Madoori, Kathie M. Hiers, Jessica Terlikowski, and my coach, Kimberly Miller are all people I want to be like when I grow up. With their expertise, committment and resources each participant in this fellowship will be equipped to do just that. While I was assigned to focus on the Affordable Care Act and Medicaid, everything somehow overlaps and we will be cross-trained in a lot of topics. What are some other issues I want to work on? We will spend the next year on webinar trainings every other week, including supplemental trainings in between. We will participate in the PWN Policy Workgroup that meets once a month to discuss local and fedeal policy issues; have reading and writing assignments from the webinar trainings; scheduled conference calls with our coaches and we will have a face to face meeting and training mid-way through in Washington D.C. Oh and the super kicker that I'm excited about is that we get to take the one issue we are passionate about and find an organization through our coach to work with that organization in bringing about effective policy change. Talk about being the hands and feet to the work! Woooo! Lastly, not only do I get to work with some of the fierecest women in the field, but we get to be coached by influential change makers. I am so honored that they will be investing time in us for a year among their busy schedules. 2017 has me feeling like Beyonce. Seriously. What's an AIDS Watch? No, it's not the new installment to Apple products. And no, as someone asked me at the airport, it is not a vigilante group that literally watches for people living with AIDS. Good grief, #45, look at the confidence you give to ingorance. Just look at it. No, AIDS Watch is the premier gathering of advocates and people living with HIV from all over the nation for a high impact policy traninng on key issues impacting people living with HIV and arming them with resources to have dialogue with their elected congress people on what they should do about it. But then, it's so much more than that! 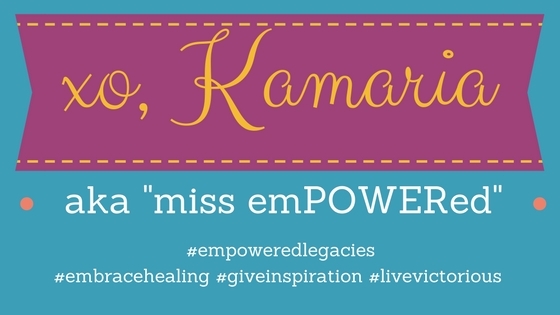 It's what an empowered legacy looks like! It's what never giving up and using the collective power of voice to create change looks like. It's presented by the Elizabeth Taylor AIDS Foundation and AIDS United and this year featured more than 650 people from 34 states, DC and Puerto Rico to continue sharing their truth and enact their power in their communities. Here's a clip of the legacy legend herself, being highlighted as our torchbearer. Powerful, right? What a way to be remembered. This made me want to do some reflecting. I know where I want to be someday, but to ensure that I get there with my behavior and dignity in tact, I found that for this phase of my life, I'd reflect on how I got here in the first place. So, as of August 2016, I am the Florida Community Organizer for The SERO Project. My job description is to go out in various communities in Florida and educate people living with HIV about the laws throughout the nation and specifically Florida that are being wrongfully used in criminal prosecutions, either under HIV specific criminal laws or under general criminal statutes. I'll explain more about HIV criminalization later. The education is part of the strategic planning for work that has been the current that has moved legislation in Florida to modernize our laws and promote a more public health friendly frame. May 2016, HIV Is Not A Crime II training conference with The SERO Project, Positive Women's Network and many other sponsors including our host organization Thrive Alabama gathered nearly 350 advocates and people living with HIV in Huntsville, AL for a national dialogue on what their state has in place as law, the successes of other states (Iowa & Colorado) on their modernization of these laws and provided skill based training to equip advocates to return home and make things happen. It was here I presented for a conference on something beyond my story. I was more than a person living with HIV, I was someone providing insight and knowledge that would promote dialogue in various communities and get people to understand their "WHY". February 2016 after prompting from various advocates in other states, I submitted my first ever in life abstract for a conference. I remember being so uncertain and afraid that I was waisting time of the people evaluating and planning HIV Is Not A Crime II, because I was inexperienced. Then I received an email saying it was accepted. What? Wait, let me go back and be sure that was meant for me! In my application, I asked that if I was selected to be paired with someone of experience that would co-sponsor because while I believed in the activity I had planned and drafted, I was not going to get up in front of a room full of experts and facilitate it myself. Nope. 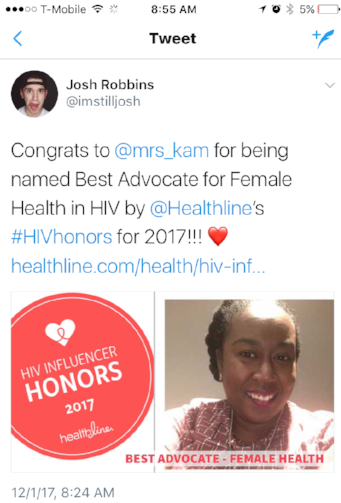 When I received a follow-up email that the unicorn of HIV advocacy, Olivia Ford was going to be my co-presenter, I then realized how real this was. We planned calls and drafted slides to develop "Being the Change You Seek in a Resistant Community", which I then was allowed to present with her two more times at the Positive Women's Network - USA Speak UP summit and Positive Living Conference 19, both in Ft. Walton Beach, FL. By the way that averaged a total of 650+ people I encountered. November 2015, an invitation was sent out to various advocates living in Florida to have discussion on what strategic plan could take place in Florida that could change our laws. I remember that meeting like it was yesterday because I had no idea what was going on through half of the conversation. But I learned the power of my not knowing what was happening because it prompts me to ask questions. It prompts me to dig deeper than what other people in the room are focusing on. Remember that, it will come up later. I say all of this as an intro to empower people to stop underestimating who they are. What you think is a weakness might be the very thing that will launch you into your purpose. What you think is a flaw, might be a characteristic someone of influence and power is looking for. What you think is holding you back might be what needs to be unleashed so that you can change the world. I thought that being a person that always had questions and alternative solutions to how things are done was annoying. I felt like if I brought up a topic or idea that was not on a planned agenda, then I shouldn't speak. Then I had to learn to understand the concept of having a seat at the table. If space has been created for you, fill that space. No matter what the intended purpose is for you being there. It could be that someone simply remembered you from a previous encounter and thought you would be a good fit. Honor that. Don't shrink yourself. Your invitation to the table could be because a quota had to be filled. I have often been the youngest, the only woman or the only person of color and sometimes all three. That fueled my motivation to make the best of this time at the table. Regardless of what brings you there, always use it as a catalyst to get another seat at a bigger table. If there is dialogue being had around a topic you have little knowledge of, do not be afraid to politely say so. I have often asked for clarity of a situation and put it on my certainty I was understanding what others were saying, by rephrasing the main point of the topic. If I missed my window to ask for clarity, I wait until the close of the meeting if this isn't provided in writing sometimes and ask the facilitator to reiterate what our individual tasks, if any are. There are many ways to make your presence known. You don't have the be at the head of the table to have an impact, but if you're not at the table my friends, you are definitely on the menu. So that is how I got to AIDS Watch in Washington D.C. Next post, I will tell you all about what I experienced there. I can tell you one thing, it was nothing anyone could prepare me for.